Dr. Ratrice Jackson, a 2011 program participant at the University of Washington. 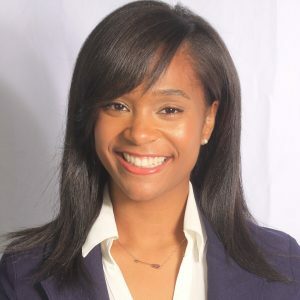 She is 2018 graduate of Meharry Medical College School of Dentistry where she received her Doctorate of Dental Surgery Degree along with earning her Masters Degree in Health Science. Dr. Jackson received the 2018 Colgate-Palmolive, National Dental Association Foundation Memorial Post-Doctoral Scholarship. Today, she is specializing in pediatric dentistry where she matched at NYU Langone Hospitals in Tampa, Florida where she will receive a certificate in pediatric dentistry in June 2020. Being born and raised in Little Rock, Arkansas led me to being a participant of a program called Arkansas Commitment. This program is an organization created to identify academically talented African-American high school students throughout central Arkansas and guide them to become leaders of society at large as well as within the African-American community in Arkansas. Henceforth, I was chosen within this program to interview among different professionals and constructed on a panel of interviewers I was placed and offered an intern within a professional field that best fit me according to a verbal questionnaire. The internship that I was placed on was in a dental office for two months within a rural area of Arkansas. This experience led to my interest in dentistry. Having learned at an early age the deficiency of a dental school in my hometown of Arkansas and the demand for selfless individuals who possess a steadfast desire to aid others—my heart continued to yearn for the opportunity to make a difference within the health profession. My experiences within the health professional field include but are not limited to: the Summer Medical Dental Education Program, internships, shadowing opportunities, and most importantly the mentors I gained throughout the process. Growing up in the state of Arkansas, I knew that I wanted to do everything that I could to get accepted into an out-of-state school. Hence, I continued to remain confident knowing that the knowledge and experiences gained would prepare me to better serve not only my community but communities abroad. Being an African American woman from Little Rock, Arkansas where there is a shortage of dental schools, I believe, makes my story unique. I have endlessly pursued opportunities that lead me to my commitment to primary health care. Hence, being fortunate to participate in a phenomenal program, “Arkansas Commitment”, I have been educated on the value of staying committed. This program has a primary mission to assist young African-American students in acquiring the knowledge, skills and professional experience necessary for effective community leadership. Many qualities that are essential to the goal of Arkansas Commitment are instilled in me and have molded a foundation for commitment. Therefore, I yearn to continue to help bridge the gap upon advancing commitment within primary health care. What surprised me the most about professional school is the heavy workload given to us and looking back realizing that it was done. Although I was forewarned of this workload that was going to be thrown my way, it was still much of a shock. However, through believing and looking back on how far I have come, it is clear that it can be done! I kept and still keep the mindset that what does not kill you makes you stronger. Indeed, this statement remains true. If given the opportunity to talk to a health profession student, I would tell them to never give up and if you have a passion —go for it! I believe once you live your life knowing and understanding that statement, not comparing yourself to others, and being confident there is nothing that will be able to stop you! To live a life committed to affecting positive change within the dental field is one of my life’s most important goals. More specifically, I want to focus on encouraging individuals throughout the world to keep fighting despite the hardships that you may encounter. Three essential qualities I believe should be kept include perseverance, passion, and altruism. I did not make it to where I am, today, alone. I took advantage of opportunities provided to me that included internships, shadowing opportunities, and focusing on being the best me I could be. When given an opportunity make sure you take advantage of it. Forming lifelong relationships can definitely aid in the future of your career. I can’t reiterate enough that when you want something—go for it! Despite what route God has aligned for your path, make sure you are doing everything can and God will do the rest. In terms of shadowing, it is important to shadow as much as possible in order to be confident in the passion and road set aside for you. Be self-assured in where you are and what you have learned to get what you want. Remember, passion translates to service on behalf of individuals who need it most. Although it has not been an easy road while working to reach my goals, I am a person that does not give up despite the circumstances thrown in my path. In a world filled with many challenges, my advice on what I would tell interested health profession students is to use difficulties as a stepping stool that motivates you to keep striving for success. In life, we will all face battles but it is up to us to persevere and continue on!